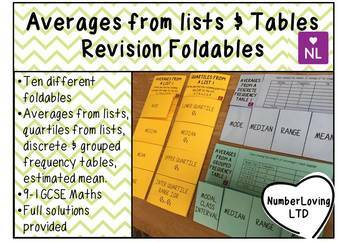 This resource covers median, mode, range, quartiles, IQR, estimated mean, modal class interval in the style of revision foldables. There are ten revision foldables in total on this topic. 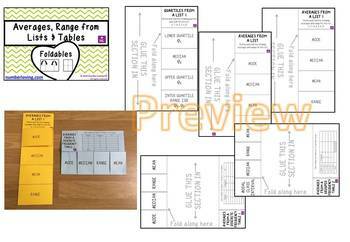 This resource is also part of our foldables bundle, check it out below. * Averages from a list; pupils define and find the mean, median, mode and range for a list of numbers which your able to insert before printing. In this pack there is at least two versions of each type of foldable more than one version of each therefore one could be used during the learning phase as an example and another during revision. In addition on download you will receive two pdf's, one is UK size paper (A4) and the second letter size (US), please print from the most appropraite following the printing instructions provided. 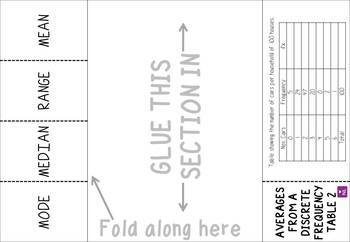 Foldables can be used as a revision or summary exercise at the end of a topic. Once complete the answers are hidden and therefore pupils can use these to ‘test’ themselves or ask someone else such as a parent to test them. All our resources come complete with instructions, solutions where appropriate and ideas to stretch and support pupils. Check out www.numberloving.co.uk for more ideas and resources like this. We hope you enjoy using this resource with your students, we would love to hear how it went, please leave a review. Get in touch via the links below. For the use of the purchaser only, see full terms and conditions.